We have so damned much coastline to explore! If that appeals to you, you owe it to yourself to move here. If you live here already and you're not doing it - please read below for inspiration. Nevermind those flat, long, sandy beaches you'll find at the resorts. 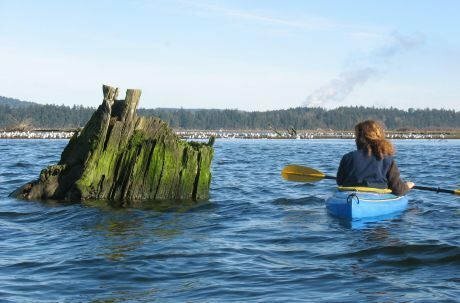 In Nanaimo, you can kayak or canoe the many rocky bluffs, deep coves, and seaweed beds. There are old artifacts and boat-access-only beaches. 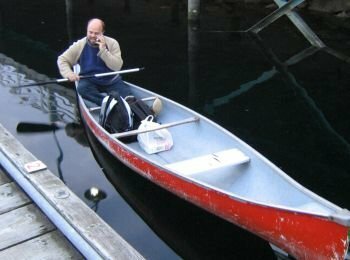 This page lists some of the best areas to explore in a little boat, whether it's a rowboat, inflated dinghy, kayak, canoe, etc. There are lots of channels and currents, litte grassy "islands", and strange driftwood pieces washed down the river or left by the tides. Check out the area close to the Living Forest campground. There are some nice bluffs, lots of big trees with eagles, a big industrial artifact, and Chase River Estuary Park (under the train trestle). This is the most popular place in town for exploring in a small boat. 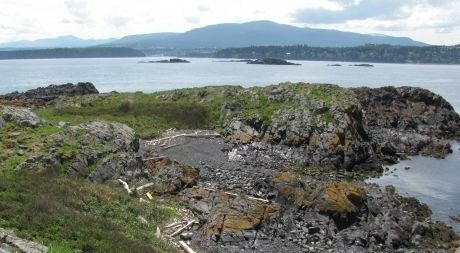 Newcastle Island is historic and very pretty, with lots of different beaches: some are sandy, some pebbly, and some are sandstone shelves with lots of interesting nooks and crannies. 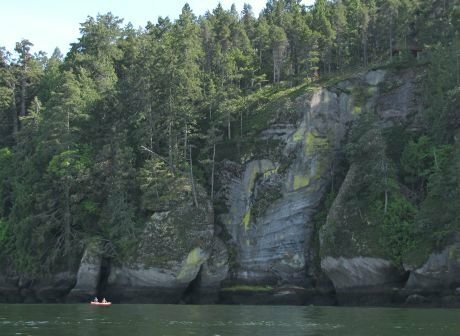 There are some very cool formations and overhangs at the north end of the island, but you have to watch for the huge BC Ferries and their wake. The island is about 8.5 km around by boat. There's more info on my Newcastle Island page. 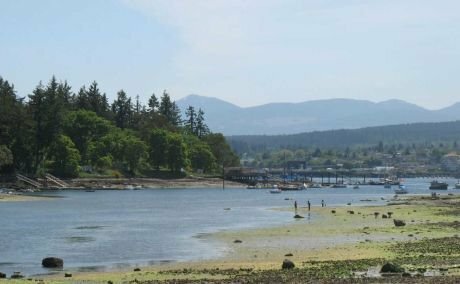 It's only 1.15 km from the marina in downtown Nanaimo to the floating Dinghy Dock Pub and restaurant at Protection Island. After you fortify yourself, you can paddle the 4.5 km around the island. Be sure to stop at Smugglers Park on the west side, and the beaches around Gallows Point at the south end. Watch the tide tables to make sure you'll be able to get through "the Gap" between the north end of the island and Newcastle Island. I spent two years living on Protection Island, paddling to downtown Nanaimo for my 9-5 job. Even in the dead of winter. I loved it, and so did my young son. PLEASE talk to me if you have any interest in this lifestyle! I have a lot of insight into what to expect - from the commute AND from the Protection Island property market. Call me or email me if you want to chat! This is a big bay with great views all around. But it can be pretty busy with the BC Ferries terminal, and a lot of boats moving to and from the marinas in the Newcastle Island channel. So be careful! Most paddlers prefer to stay in the northern areas of Departure Bay, near Jesse Island and Stephenson Point. Or they go to the Saltery Bay area of Newcastle Island. It's a quick jump from either of these spots to the Hudson Rocks (see below). 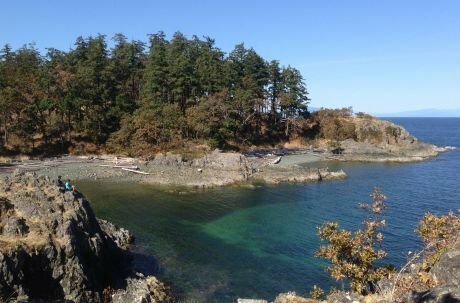 These are smaller islands out in the open water, but close enough to the shores of Nanaimo that they can be accessed by adventurous paddlers. Read more on my Five Fingers page and my Snake Island page! There are some rocky nooks to explore around here, as well as the locally famous Shack Island. Pipers Lagoon itself may be a good sheltered place to practise wet exits from your kayak, as long as the tide is high enough. Neither Pipers Lagoon nor Neck Point offers a long coastline to explore by kayak, so you would probably extend your experience by paddling between them, or to the Hudson Rocks and Five Finger Island to the east. The Ballenas-Winchelsea Archipelago includes 19 islands, but I only know about the Winchelsea Islands group, just north of Lantzville and east of Nanoose Bay. South Winchelsea Island is owned by a land conservancy, while the other islands in the group are crown land.